Abstract: static details of non-conventional gilts: index-linked with 3-month and 8-month lags; ‘perpetuals’; floating-rate; and variable-rate. Publication history: only at www.jdawiseman.com/papers/finmkts/papers/gilt_statics_non-conventionals.html. Usual disclaimer and copyright terms apply. Contents: • Introduction; • Canadian-style Index-Linked Gilts, with three-month lag; • Old-style Index-Linked Gilts, with eight-month lag; • The ‘Perpetuals’; • Floating-Rate Gilts; • Variable-Rate Gilts. Also see details about conventional gilts. 24th September 2016: updates of this page will be infrequent. There might be further data on the website of the UK Debt Management Office. As a gilt analyst I collected data on gilts, some of which is still not widely available, so is being published here. Much of the gathered data is about conventionals, which can be found at www.jdawiseman.com/papers/finmkts/gilt_statics.html. This page holds data relating to the index-linked gilts (both three-month and eight-month), perpetuals, floating-rate gilts, and variable-rate gilts. Most of the fields/columns have the same meaning as those in www.jdawiseman.com/papers/finmkts/gilt_statics.html, wherein descriptions can be found. The DMO is also taking the opportunity to introduce a new indexation structure into any new index-linked gilts issued from 2005-06. Specifically, any new index-linked gilt issued from 2005-06 will use a three as opposed to the current eight-month indexation lag to the RPI. This reflects the adoption of a three-month lag as current international best practice. … Note that the DMO does not intend to introduce a deflation floor. The introduction of any new three-month lag index-linked gilts from 2005-06 does not mean that current eight-month lag index-linked gilts cannot be re-opened. It happens that, in January 2004 the LSE switched from numeric Sᴇᴅᴏʟs to alphanumeric Sᴇᴅᴏʟs. So, for all ILGs with an eight-month lag, characters 3-12 of the ISIN are numeric; for all ILGs with a three-month lag character 5 of the ISIN is non-numeric. A comment on coupons not being zero: the many small payments entail some small administration cost. But those same payments allow tracing of missing holders. If a natural owner dies, or a corporate owner is wound up, with a zero coupon bond this might not be discovered until an attempt is made to pay the principal, perhaps decades later. With a positive coupon the failed payment would be discovered within half a year, soon enough for there to be a good chance of finding the successor owner. This seems sensible. But observe that Germany issues 10-year zero-coupon conventionals, such as the Bund 0% of 15 Aug 2026; and there is a Swiss 0% of 22 June 2029; and this argument would obviously fail for long-dated strips. Coupon: the coupons of index-linked gilts, both 3- and 8-monthers, are integer multiples of ⅛%. Even large coupons have been rounded to 12½ basis points: e.g., 4⅛% 30s, 4⅜% 04s, 4⅝% 98s, as well as 1⅞% 22s. Coupons have always been strictly positive, so ≥ 0⅛%, even with very negative real yields. First coupon amount: real first coupon amounts are not rounded, and are shown in a format that can be copy-pasted into Excel. Cash first coupon amounts are rounded “to six places of decimals”. 0.125 22 Mar 2068 249.7 25 Sep 2013 22 Mar 2014 =(0.125/2)*(178/181) 54.49 0⅛% Index-linked Treasury Gilt 2068 GB00BDX8CX86 BBG0057VMB12 68s, on 09 Oct 2013, had a modified duration of 52.78 years, perhaps a record for a gov’t bond. 62s was longest linker from issue until Sep 2013 when 68s was issued, the previous longest having been 55s. 55s is the first-issued of the Canadian-style UK ‘linkers’ and hence first of the ILGs paying 22May/Nov (pre-announcement, announcement); the first named Index-linked Treasury Gilt rather than Index-linked Treasury Stock; and the first linker with a non-numeric Sᴇᴅᴏʟ (not counting the temporary Sᴇᴅᴏʟs of reopenings). 55s was longest linker from issue until Oct 2011 when 62s was issued, the previous longest having been the 8-monther 35s. 0.500 22 Mar 2050 213.4 25 Sep 2009 22 Mar 2010 =(0.5/2)*(178/181) 40.49 0½% Index-linked Treasury Gilt 2050 GB00B421JZ66 BBG0000NBYJ1 The first to be issued of the ILGs paying 22Mar/Sep (announcement). 0.125 10 Aug 2048 274.79333 08 Nov 2017 10 Feb 2018 =(0.125/2)*(94/184) 30.76 0⅛% Index-linked Treasury Gilt 2048 GB00BZ13DV40 BBG00J2D03W5 The first to be issued of the ILGs paying 10Feb/Aug (announcement). A slightly sloppy announcement on 23 March 2018. The minutes of the consultation meetings said “The gilt operations calendar for April-June 2018 will be announced by the DMO at 7.30am on Friday 23 March 2018.” And it was, on the wire services; but not on the website until more than an hour later. Further the wire-services version, but not the PDF, had a footnote “[*to pay a long first dividend on 10-Feb-2019]”. 0.125 22 Mar 2024 242.41935 12 Oct 2012 22 Mar 2013 =(0.125/2)*(161/181) 11.44 0⅛% Index-linked Treasury Gilt 2024 GB00B85SFQ54 BBG003G3FFD5 New 24s, on 11 April 2013 was the first gilt to be auctioned at a real yield below negative one percent, indeed at -1.262%. 1.875 22 Nov 2022 205.65806 11 July 2007 22 Nov 2007 =(1.875/2)*(134/184) 15.36 1⅞% Index-linked Treasury Gilt 2022 GB00B1Z5HQ14 BBG0000CDS24 22s, on 23 Aug 2011, was the first gilt to be auctioned at a negative yield (albeit a negative real yield). 1.250 22 Nov 2017 193.725 08 Feb 2006 22 May 2006 =(1.25/2)*(103/181) 11.79 1¼% Index-linked Treasury Gilt 2017 GB00B0V3WQ75 BBG0000BPHW4 Principal payment at maturity = £141.943000 per £100 (the first principal amount for which the DMO was the calculation agent). The introduction of inflation-linked securities was announced in the Budget Speech on 10 March 1981. Further explanation was published in May 1981. This was to be the first large inflation-linked government debt market. These old-style ILGs have payments with an eight-month lag: the nominal÷real factor is the RPI eight months before the month of payment divided by the RPI eight months before the month of first issue. The eight-month lag ensures that the £ value of a coupon is known before the start of that coupon period, which can then be used for the calculation of accrued interest. However, in January 1987 the RPI was re-based from 394.5 to 100, so some base indices are re-based with a “/3.945”. Prices are quoted nominal. Nominal payments are rounded: initially to the nearest penny per £100; for ILGs issued after Feb 1982 (so starting with 88s) the number of decimal places was upped to 4; and for the 35s only to 6 decimal places. This is in the “D.P.” column. For 8-month ILGs issued ≤1992, so for those up to 30s, a change “to the coverage or the basic calculation of the Index … which would be materially detrimental to stockholders” would give holders a right to put the gilt back to HMT at inflation-adjusted par. But for 35s, and similarly for the 3-monthers, the index could be replaced with another index that “continues the function of measuring changes in the level of UK retail prices”. 35s was the last-issued of the UK ‘linkers’ with an eight-month lag; the last to be named Index-linked Treasury Stock rather than Index-linked Treasury Gilt; and the last with a numeric Sᴇᴅᴏʟ. It is the only eight-month linker for which payments are rounded to six decimal places; the only for which the calculation agent is the DMO rather than the BoE; and the only of which the first coupon was computed with the post-1998 Act/Act formula. 35s was also the only 8-monther for which the index could be replaced with another index that “continues the function of measuring changes in the level of UK retail prices”, without giving holders a right to put the gilt back to HMT at inflation-adjusted par. The auction of 35s on 25 Sep 2002 was uncovered: £900m for sale; £853.12m bids received; 0.95× covered: “The unallocated part of the amount on offer at this auction is being held in official portfolios.” Needless danger: there is a solution. Of the gilts of which the first coupon was computed with the old Act/365 formula, 30s will be the last to mature (preceded by 6%28). The auction of 30s on 28 Apr 1999 was uncovered: £500m for sale; £470.3m bids received; 0.94× covered: “The unallotted part of the amount on offer at the auction is being held in official portfolios. It will not be made available to the market at a price below the striking price for a period of at least two-months.” Needless danger: there is a solution. 2.500 16 Apr 2020 =327.3/3.945 4 12 Oct 1983 16 Apr 1984 1.1138 36.51 2½% Index-Linked Treasury Stock 2020 GB0009081828 BBG00000KDR8 Of the gilts issued before 29 May 1985, linker 20s will be the last to mature (preceded by 16s). Of the gilts issued before 29 May 1985, linker 16s was the second-last to mature (to be followed by 20s). Principal payment at maturity = £318.2953 per £100. 2.500 16 Aug 2013 =351.9/3.945 4 21 Feb 1985 16 Aug 1985 1.228 28.49 2½% Index-Linked Treasury Stock 2013 GB0009036715 BBG00000KDP0 Principal payment at maturity = £276.6768 per £100. 2.500 23 Aug 2011 =294.1/3.945 2 28 Jan 1982 23 Aug 1982 1.26 29.57 2½% Index-Linked Treasury Stock 2011 GB0009063578 BBG00000KDN2 Principal payment at maturity = £306.37 per £100. 2.500 20 May 2009 =310.7/3.945 4 19 Oct 1982 20 May 1983 1.5161 26.59 2½% Index-Linked Treasury Stock 2009 GB0009071563 BBG00081MWT2 Principal payment at maturity = £277.3054 per £100. On 19 July 2001 £½bn 06s switch-auctioned into 16s: announcement; memorandum; result. Principal payment at maturity = £278.63 per £100. 4.375 21 Oct 2004 135.6 4 23 Sep 1992 21 Apr 1993 1.8017 12.08 4⅜% Index-Linked Treasury Stock 2004 GB0009982686 BBG0006J7R22 Principal payment at maturity = £135.5457 per £100. 2.500 20 May 2003 =310.7/3.945 4 27 Oct 1982 20 May 1983 1.4592 20.56 2½% Index-Linked Treasury Stock 2003 GB0009066365 BBG00066HZH5 Principal payment at maturity = £225.5011 per £100. 2.500 24 Sep 2001 =308.8/3.945 4 26 Aug 1982 24 Mar 1983 19.08 2½% Index-Linked Treasury Stock 2001 GB0009065391 BBG000K2LKC1 Principal payment at maturity = £218.5846 per £100. Nickname = “Maggie Mays”, because convertible into 10Q99. And almost all converted, because Maggie did. Principal payment at maturity = £200.4876 per £100 (the BoE press release containing a titling error). 4.625 27 Apr 1998 135.6 4 21 Sep 1992 27 Apr 1993 2.2448 5.60 4⅝% Index-Linked Treasury Stock 1998 GB0009982579 BBG0003K0P32 Principal payment at maturity = £116.8879 per £100. The first-issued UK ‘linker’. And the joys of inefficient markets! According to the BoE Quarterly Bulletin, June 1981, p176, bidding was in multiples of 25 pence (≈ 1.88bp), and prices bid ranged from ≤£89¾ (real yield≈2.76%) to ≥£130 (≈−0.3bp). It was issued at par, suggesting that the BoE also didn’t know the right price. Re bidding resolution, I have argued that it now should be “at least as fine as 0.1¢ or an eighth of a thirty-second”. Principal payment at maturity = £221.17 per £100. 2.000 16 May 1994 102.9 4 02 June 1988 5.96 2% Index-Linked Treasury Stock 1994 GB0009079632 Principal payment at maturity = £137.9008 per £100. 2.000 23 Mar 1992 =385.8/3.945 4 18 Feb 1987 23 Sep 1987 5.10 2% Index-Linked Treasury Stock 1992 GB0009077925 Principal payment at maturity = £136.8172 per £100. A prospectus dated 29 Dec 1983 was published in The Times of 02 Jan 1984. Principal payment at maturity = £135.8715 per £100. A prospectus dated 09 Mar 1982 was published in The Times of 11 Mar 1982. Principal payment at maturity = £135.1736 per £100. Much funding used to be via callable gilt-edged securities with no final maturity date. Income, and more income, and no promise of ever seeing the principal. Some could be redeemed only by Parliament, which delegated this power to the DMO in the Finance Act 2015, s.124 (see announcement in §A.1 on p93 of the Autumn Statement 2014, and explanatory notes for the legislation). All the perpetuals were redeemed during 2015. The following table draws heavily on (and adds to) pp23-24 of the DMO Annual Review 2014-15. 4% Consolidated Loan (1957 or after) 218.4 1 Feb/Aug 19 Jan 1927 01 Feb 1957 1 Feb 2015 GB0002163466 BBG00000KF66 Issued for cash and in exchange for 5% Treasury Bonds 1927, 4% National War Bonds 1927, 5% National War Bonds 1927, 5% Treasury Bonds 1933-1935, 4½% Treasury Bonds 1932-1934 and 4½% Treasury Bonds 1930-1932. Issued in exchange for 5% War Loan 1929-1947. See the London Gazettes of 30 June 1932 and 12 July 1932, and the Edinburgh Gazette of 05 July 1932. The shortest Bloomberg ticker for 3½% War Loan was ZZ2036940 Govt. Also see Jeremy Wormell’s letter to the Financial Times published 19 Mar 2012. Issued in exchange for 5% National War Bonds 1922, 1923 (Apr and Sep), 1924 (Feb and Oct),1925 (Apr and Sept). Had an active sinking fund. The shortest Bloomberg ticker for 3½% Conversion was ZZ2036932 Govt. 3% Treasury Stock (1966 or after) 34.6 1 Apr/Oct 01 Mar 1946 05 Apr 1966 8 May 2015 GB0009031211 BBG00000KF20 Issued in exchange for Bank Stock in accordance with the provisions of the Bank of England Act 1946. 2¾% Annuities 0.7 5 Jan/Apr/Jul/Oct 17 Oct 1884 05 Jan 1905 5 July 2015 GB0000436294 BBG000022GR7 Issued by exchange for New 3% Annuities, Reduced 3% Annuities and Consolidated 3% Annuities, as detailed in the The London Gazette, 8 Aug 1884, pp3573-4. The shortest Bloomberg ticker for 2½% Treasury was ZZ2036973 Govt. Issued in exchange for Consolidated 3% Annuities (1752), Reduced 3% Annuities (1752) and New 3% Annuities (1855). The shortest Bloomberg ticker for 2½% Consols was ZZ2036965 Govt. Issued in exchange for South Sea Stock, Old South Sea 3% Annuities, New South Sea 3% Annuities, Bank 3% Annuities (1726) and 3% Annuities (1751). The shortest Bloomberg ticker for 2½% Annuities was GG7183682 Govt. In 1994, with a bond-market crash continuing, the BoE issued a floater, paying (a private fixing of) Libid minus 12½bp. Two years later a second was issued. There was and is a daily market fixing of Lɪʙᴏʀ, but not of Libid. Why use a private fixing? Was the BoE already aware of the problems that would later become the Lɪʙᴏʀ scandal? Or was it beneath the Old Lady’s dignity to use the same fixing as everybody else? Or both? 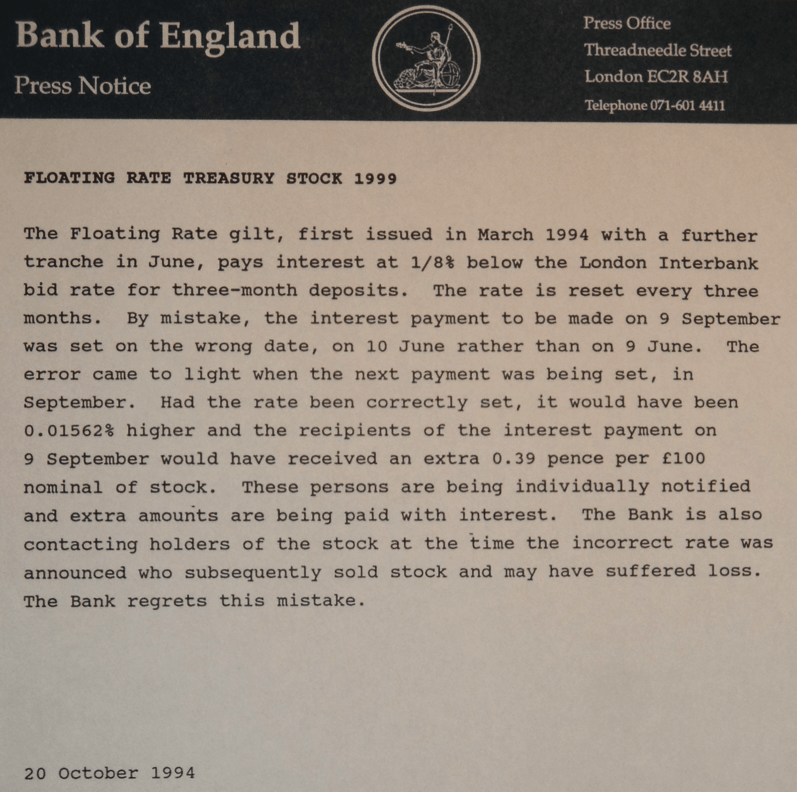 The Floating Rate gilt, first issued in March 1994 with a further tranche in June, pays interest at 1/8% below the London Interbank bid rate for three-month deposits. The rate is reset every three months. By mistake, the interest payment to be made on 9 September was set on the wrong date, on 10 June rather than on 9 June. The error came to light when the next payment was being set, in September. Had the rate been correctly set, it would have been 0.01562% higher and the recipients of the interest payment on 9 September would have received an extra 0.39 pence per £100 nominal of stock. These persons are being individually notified and extra amounts are being paid with interest. The Bank is also contacting holders of the stock at the time the incorrect rate was announced who subsequently sold stock and may have suffered loss. The Bank regrets this mistake. Nominal size was £2½bn+£2bn = £4½bn; error was 0.39 pence per £100; so the under-payment totalled £175,500. The used fixing of Libid was a private fixing, and done only when needed, so it is not clear how the BoE could have known the value of this private fixing on a date on which it was not done. Three-month GBP Libor dropped 1.563bp between the 9th and 10th: perhaps this was used, with a small error added to hide the mechanism (perhaps, cunningly, an error chosen such that it was removed by rounding). Moral: needless complexity is needless. Sterling money-markets were and are Act/365, and gilt accrual and yield conventions were then Act/365. So we assume that a year has 365 days. Also assume that the 91-day T-Bill discount rate was d. We want to know the breakeven, at which the +50bp precisely offsets the use of a discount rate as a simple yield. Temporarily assume that each coupon period was 91 days. Then the simple yield was (1/(1 − d×91/365) − 1)×365/91, which is to equal d+½%. In Mathematica (.nb, .pdf) NSolve[d + 1/200 == (1/(1 − d×91/365) − 1)×365/91 && d > −0.1 && d < 4, d] returns 13.9138%, consistent with Wormell’s “13·914 per cent”. Except that the Bank of England said “interest payable half-yearly”, and Belchamber said “semi-annual payment”. So instead d should be converted to a simple yield of half-year term, assumed to be 182½ days. And NSolve[d + 1/200 == ((1 − d×91/365)^(−182.5/91) − 1)×365/182.5 && d > −0.1 && d < 4, d] returns 11.3328%. Alternatively assuming a year of 365¼ days and an average coupon period of 182⅝ days, which are not the usual £ convention, gives 11.2405%. So it seems that Wormell’s “13·914 per cent” is too high by more than 2½%. Please could others check my reasoning and calculations, and let me know of agreement or reasoned disagreement. Thank you. In mid-Feb 2016 Jeremy Wormell was informed of this criticism. He said that he might reply (and presumably might not). Three Treasury Variable Rate Stocks (TVRS) have been issued: in May 1977 (to mature in November 1981), July 1977 (maturing in June 1982); and January 1979 (March 1983). Each was for £400 million with interest payable half-yearly, at an annual rate ½% above the daily average of the rate of discount on 91-day Treasury bills over a previous six-month period. There appear to be six reasons for the failure of the experiment. … Fifth, the ½ per cent margin over the Treasury bill discount rate become worth less, as a proportion of the rate, as interest rates rose: ½ per cent over a 7 per cent rate is very different from ½ per cent over 14 per cent. Finally, the return was based on the discount rate on Treasury bills and not the yield. The difference absorbed the ½ per cent margin when the discount rate on bills reached 13·914 per cent. Interest was paid semi-annually at the average of the weekly three-month Treasury bill rate over the period from the preceding ex-dividend date to the ex-dividend date prior to the payment plus a margin of 50 basis points in yield. There were three issues in the late 1970s of £400m each. They were redeemable in 1981, 1982, and 1983 with maturities at issue of four, five, and six years respectively. These issues were not ultimately successful. The coupon structure was fully mismatched. A three-month rate was used to determine a semi-annual payment of a weekly refixing basis. This complexity made analysis virtually impossible and acted as a deterent to investors. No such issues currently exist.